Power washing is the number one way to take as good care of the outside of your property as you do of the inside. It is an important part of property maintenance, transforming weathered looking exteriors quickly and easily. To make sure that it is does properly, it is important to rely on experts with power washing experience. Professional pressure washing by USA Clean Master can make your home or business look fabulous, from concrete driveways to cloth awnings and all types of siding: aluminum siding, vinyl siding, and even brick exteriors. Dirt, grime, and oil stains can make your home look older than it is, while a little bit of cleaning can totally transform its appearance. This is where power washing comes in. Water is sprayed at a controlled pressure to power wash a house, cleaning siding, walkways, patios and more. It even works on roofs and gutters! After having your driveway or patio thoroughly cleaned, you should consider having it sealed as well. Concrete sealing protects your driveway from cracking due to water freezing and expanding inside the concrete during the winter time. We go out of our way to meet the requirements of businesses for cleaning exteriors, roofs, gutters, patios, walkways, and parking lots. 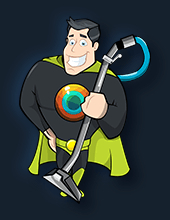 We clean on weekends to make it easier for you to work cleaning into your busy schedule. USA Clean Master is truly one stop for all of your business cleaning needs, both inside and out. Every home and business has its individual needs, like cleaning siding or a multi floor building, scouring walkways from concrete, brick, or stone, or even waterproofing. USA Clean Master is proud to provide you with superior roof cleaning and power washing at affordable prices. We also take care of graffiti removal, awnings, rust stains, and oil stains. Call us today on 888-396-5195 to schedule your site inspection and estimate. Rain goes where it is supposed to when gutters are unobstructed and in good repair. Get your fireplace ready for cold weather with our experienced chimney sweeps. Not only will you have a healthy home, but a clean ventilation system may save you money too!